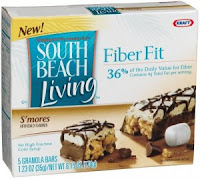 South Beach Living Fiber Fit Bars, S'mores is a delicious source of fiber. It includes the flavors of marshmallow, graham crackers and chocolate. Answer a few short questions to receive a FREE sample of South Beach Living Fiber Fit Bars, S'mores.